GULF SHORES, Ala.—Meyer Vacation Rentals Owner and SH Enterprises Inc. Chairman of the Board Sheila Hodges was one of three women honored as vacation rental management industry pioneers during the inaugural VRM Intel Women’s Summit held in February in New Orleans. 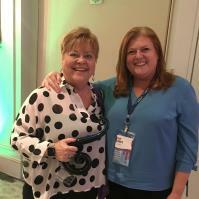 PHOTO CAPTION: Meyer Vacation Rentals Owner and SH Enterprises Inc. Chairman of the Board Sheila Hodges, left, poses with VRM Intel Founder and Editor Amy Hinote following the presentation of VRM Intel’s inaugural pioneer award. With the responsibility of managing 1,100+ individually owned condos and homes in its vacation rental inventory and driven by an unwavering commitment to providing superior service and support to vacation rental property owners and guests, Meyer Vacation Rentals has helped hundreds of thousands of vacationers stay, play and create lifelong memories in Gulf Shores, Fort Morgan and Orange Beach, Alabama, and Perdido Key, Florida, since 1967. Learn more at www.MeyerRE.com.